On January 13, 1898 French writer Émile Zola's famous J'accuse was published as an open letter in Paris' literary, arts, and social issues l'Aurore. Addressed to French President Félix Faure, Zola famously defended Alfred Dreyfus who had been unlawfully jailed for treason. 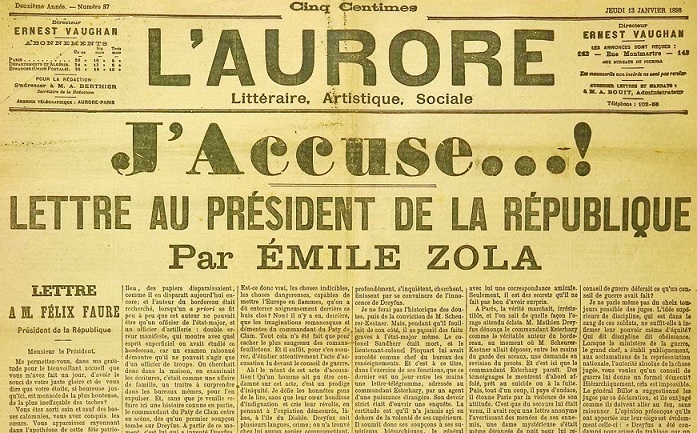 Zola also accused government officials of framing Dreyfus along with charges of anti-Semitism in what was to become known as The Dreyfus Affair. One month later on February 23, 1898 Zola was convicted of libel and fled France. Zola returned to France in June, 1899. Dreyfus was exonnerated in 1906. What follows is an English translation of Zola's famous letter.